With hefty endorsement deals from Speedo and Under Armour, now-retired Olympian Michael Phelps doesn't need a new job anytime soon. 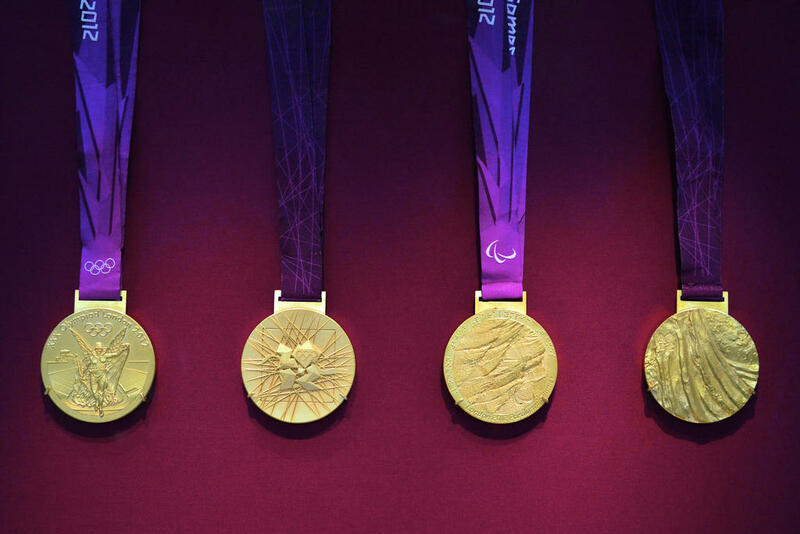 But aren't you a little bit curious about just how much those twenty-two gold medals worth? Today, the true worth of an Olympic gold medal. And from the best of sport to the worst of music - From Bob Dylan to Yoko Ono, audiences have long had a fascination with the off-beat or out of tune. So why do we love some bad singers, and love to hate others? There's no doubt that Olympian Michael Phelps is retiring a very wealthy man - endorsements from Under Armour, Speedo, and Louis Vuitton have left him with an estimated net worth around 55 million dollars. But endorsements aside, Michael is also the owner of another veritable gold mine, namely his medals. Here to speak with us about the worth of Olympic gold medals is Jacob Bogage; he covers business, technology and finance for the Washington Post. Related: How Much Are Michael Phelps' Gold Medals Really Worth? At USA Recycling in east LA, a two-story yellow crane smashes cars, refrigerators and appliances, and transforms them into neat piles of wreckage . The matriarch of this dusty enterprise is Lilian Alfonzo. She's dealing with a scrap metal problem of her own - a family with a history of trying to trick the scales. This audio postcard was produced by Denise Guerra. The End of the Barbershop? There is a time-honored place where the smell of talcum powder fills the air, where the straight-edge razor is still a sacred tool, where the burn of after shave is tempered by the refreshing cocoon of a hot towel. And where, and of course, guys can be guys. We're talking about old-school barbershops. Once staples in small town and urban communities alike, these group hangouts are slowly disappearing - a trend that raises questions about the community, social bonding, and socio-economics of getting a trim. Kristen Barber is an author and assistant professor of sociology at Southern Illinois University. Her new book is called Styling Masculinity: Gender, Class, and Inequality in the Men's Grooming Industry. When it comes to music, Americans have a bit of a love affair with the off-beat, the musical misfits, those out of tune vocalists that manage to captivate audiences despite having less than perfect technique or tone. But it's more complicated than that... because sometimes we love to love bad singing, sometimes we love to hate it, and sometimes bad singing transcends it's badness and somehow becomes good. Carl Wilson is a music critic for Slate where he recently wrote about this very subject - a sort of meditation on our cultural attraction and repulsion to bad singing. From corporate America, to politics and yes, public radio, internships, many of them unpaid, have become a regular part of the resume building and job-seeking process in America. But who is really benefiting? Malcolm Harris is a writer and editor for The New Inquiry and contributing writer for the Pacific Standard. He writes that America's reliance on interns is perpetuating gender and income inequality, and goes on to propose a rather concrete solution: end internships.